In traditional Tarot, The Moon Key is fraught with wonderful Goddess symbols. The Key depicts Moon in three phases (Maiden, Mother, Crone). 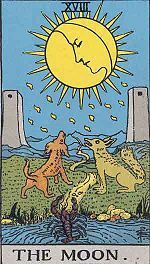 The Moon is surrounded by falling Yods (as we saw in The Tower Key), reminding us that the Life-force from above always falls on those who seek guidance. In the foreground of the Key is the pool of the Cosmic Mind, from which a crayfish (symbolic of the early stages of unconsciousness unfolding) emerges. From the snow-covered mountains in the background, the waters of intellect and reason merge into a stream flowing in the pool. On one side of the stream stands Wolf, Mother Nature’s untamed creation. On the other stands Dog, representing humankind’s adaptation to the world around us. Halfway up the stream (path) are the twin towers humans have created to protect themselves from a hostile environment. These are not the same towers of spiritual strength seen in The High Priestess Key. The Moon Key reminds us that Grandmother Moon watches over our spiritual journey toward enlightenment. Numerologically, Key 18 (1+8=9) is the Key of completion of the second phase of The Fool’s journey (the first phase ended with The Hermit – Key 9). The Fool continues along the path, learning, growing, falling back, and learning again. The Moon is the Key of intuitive ability, of dreams and premonitions. If we would only listen to the lessons of the subconscious, learn to trust our intuition, the path that carries us between the towers and to the mountaintop would not seem so steep.